Sheila Carter, 83, went to be with the Lord on March 27 th , 2019 with family by her side in Alabaster, Alabama. Sheila was born in Stinesville, Indiana on November 27 th , 1936 to Ross and Cleo Taylor. She married Jim Carter on February 25 th , 1955 and devoted her life to raising a strong and healthy family. She also loved her church and her church family. While they lived in many parts of the country, Sheila and Jim always considered Alabama to be their home. She was an avid knitter and created many knitted goods for all her loved ones. She was also a very skilled cook, and her lemon merengue pie will be missed by all. Sheila considered her family her biggest blessing and comfort. She often said that sharing stories with family around a home-cooked dinner was her favorite pastime. 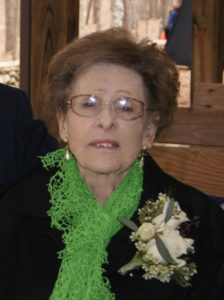 She is survived by her husband of 64 years, Jim Carter; her children, Cindy Miller (husband Ed and son Sean), Sonya Boozer (husband Bobby and children Taylor, Whitney, Jacob, and Morgan), Trudy Carter (children Gavin, Colleen and Meghan), John Carter (wife Robin and children Chad, Wade, and Todd), and Tracy Carter. She was also blessed to have twelve great-grandchildren. Sheila is predeceased by her parents and her brothers Malcom and Travis Taylor. 20200 Hwy 25 Columbiana, AL 35040. Memorial service to be held at Columbiana Church of the Nazarene on April 27th at 10:00 am. Address above.